Imagine if you were a vampyre... and unlike urban legend, becoming a vampyre isn't transmitted by a bite, it's a natural process that happens to a small percentage of teenagers as they transition to adulthood. 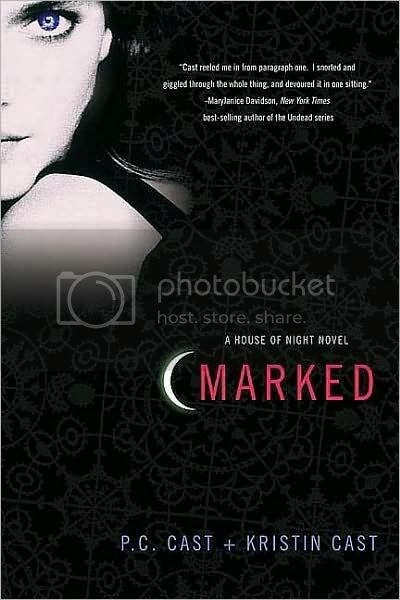 The House of Night is a finishing school to help fledgling vampyres negotiate the change they are undergoing. After the distinctive tattoo-like markings common to vampyres appear, 16 year old Zoey Redbird is ostracized by everyone in her straight-laced family except for her Native American grandmother. Zoey is whisked away from her mediocre human high school in order to deal with the unusually strong gift of magic powers granted to her by the vampyre goddess, Nyx. Almost immediately, she's invited to join the Dark Daughters, an exclusive sorority, and befriends her roommate Stevie Rae as well as a few select outcasts, including her gay friend Damien. Together, they form a new nexus of influence at the school, upsetting the delicate balance of politics and machinations that develop amongst the vampyre cliques there. The school sounds more like a cross between a summer camp and a high end boarding school. Students enjoy lessons in Equestrian studies, drama, economics and modern English classics with smart, challenging, vampyre teachers who treat their young charges with the independence and respect usually only accorded to successful college students. (They're even allowed to drink alcohol.) In the college campus-like environment, there's plenty of opportunities for students to hook up as well, which scandalizes Zoey. I was unsure what to make of Zoey's Native American heritage. Some of it seemed to be accurate and specific to the place (Oklahoma) but it seemed like the magic system was a mish-mosh of traditions from paganism, Greco-Roman myths, Harry Potter, and Twilight. Spelling vampire with a "y" irritated me. Plenty of pop culture references make the book feel just a bit dated. Zoey has the makings of a Mary Sue, with her perfect looks, super powers and bevy of male characters who fall for her, but readers who enjoy vampire books or boarding school books may enjoy this one.